For instance in stews, verjus can be added to the meat as it is searing. Then once the other ingredients have been added and the stew has cooked for a while, adding more verjus will “re-awaken” the flavors. It doesn’t overwhelm the other ingredients the way vinegar or salt can; it simply gives the dish a light, crisp, fresh flavor. For the same reason the Farm to Shaker movement among artisan bartenders (an outgrowth of Farm to Table) has embraced verjus as a popular cocktail ingredient. It’s such an American story. A woman who grew up in a Persian-American family in Marin County, met a man whose background is Greek and who grew up in Kokomo, Indiana. 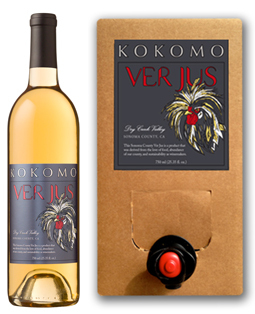 Together with a partner, they now make Kokomo Wines and Kokomo Culinary Verjus. Erik Miller is a wine grape grower and winemaker, along with the couple’s partner, Dale Peters. Kimia and Erik met when she and her parents visited the winery. “Erik gave us a tour, barrel tasting, the works.” It seems that people who love good wine and good food just naturally gravitate towards each other. Kimia and Erik were really interested in the culinary history behind verjus. They researched and experimented, as they developed their product. 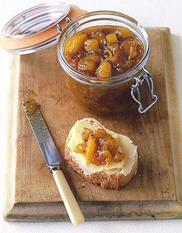 One person who intrigued them was Maggie Beer who had revived the use of verjus in Australia. Erik takes the same approach to the verjus as he does to the Kokomo Wines he makes. Each vintage has its own characteristics. 2014 is the third harvest of green grapes for verjus. They have been experimenting with harvest times, based on factors rooted in the terroir of their vineyard and in the seasonal differences form one year to the next. The process of making wine and making verjus are complimentary, because the same equipment is used for both. However, the green grapes for the verjus are pressed and bottled immediately after harvest. The low sugar content of the grapes, at this point in their maturation, means that fermentation doesn’t take place, but verjus is fresh fruit juice, so the bottle should be refrigerated once it is opened. The 3-liter bag-in-a-box is an alternate, especially for chefs for whom refrigerator space is precious. That technology makes refrigeration unnecessary and adds to the utility of the product.